Stewart Watt’s photographs are known and admired by many people, from his images of the night skies over Caithness to his pictures of birds and other wildlife. 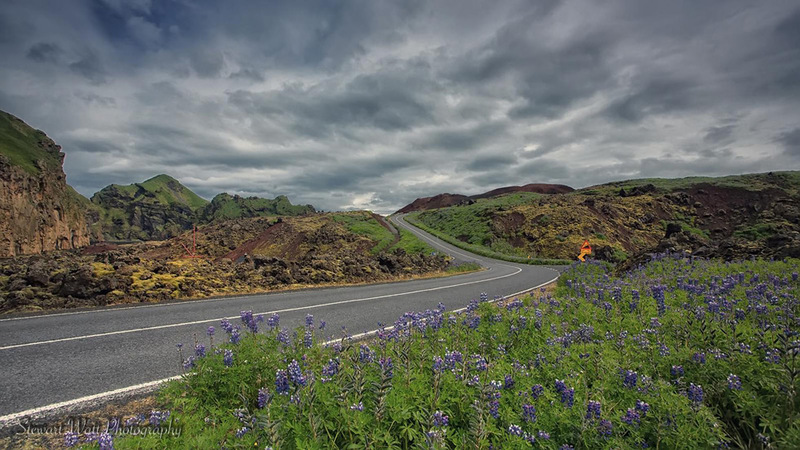 He went for a holiday this year to Iceland, and we asked him for some scenes from the journey. 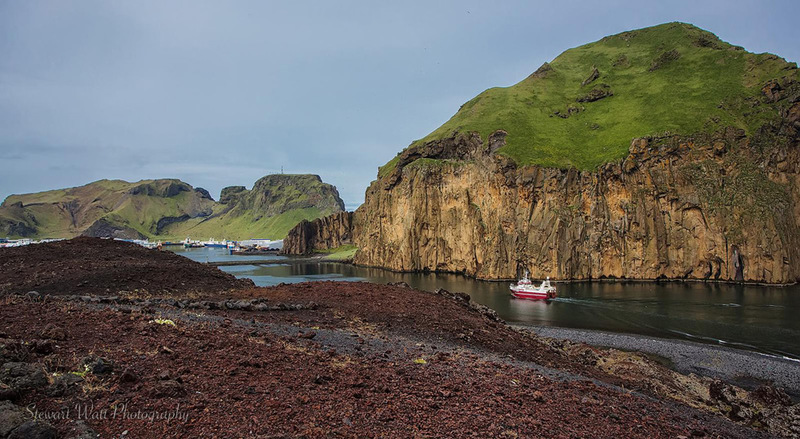 These first three pictures are all shots of the 1973 eruption on Heimaey on the Westman Islands. 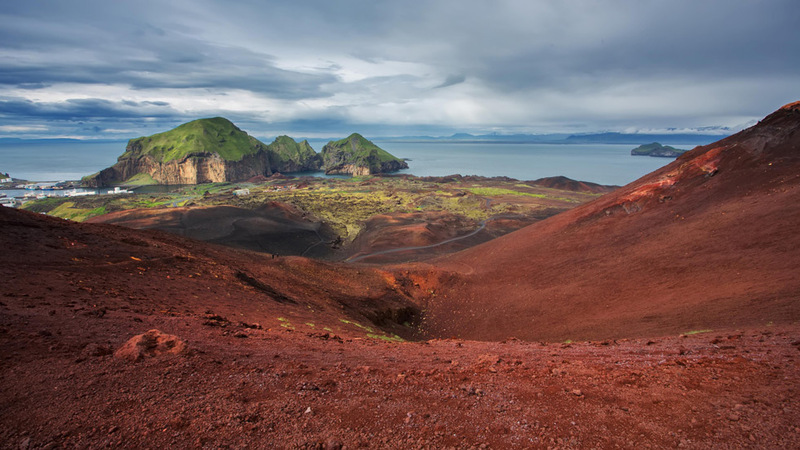 They are small volcanoes and eruptions by Iceland standards but easy for the public to get up close and personal. This first shot is from the top of Eldfell and shows the direction of the lava flow all the way down to the harbour entrance. This shows the ferry in the harbour entrance and the lava (bottom right) shows how close it came to blocking the entrance. Were it not for the local people hosing sea water with a vast array of hoses which managed to stem the flow of lava, the entrance would have been blocked. This is again the harbour entrance and the new land created by the eruption which has actually given them a much better protected harbour. The dormant Helgafell volcano taken from the slopes of Eldfell. This shows where the lava from the 1973 eruption came to rest. It’s to the right, on top of what I think was a public pool or baths. 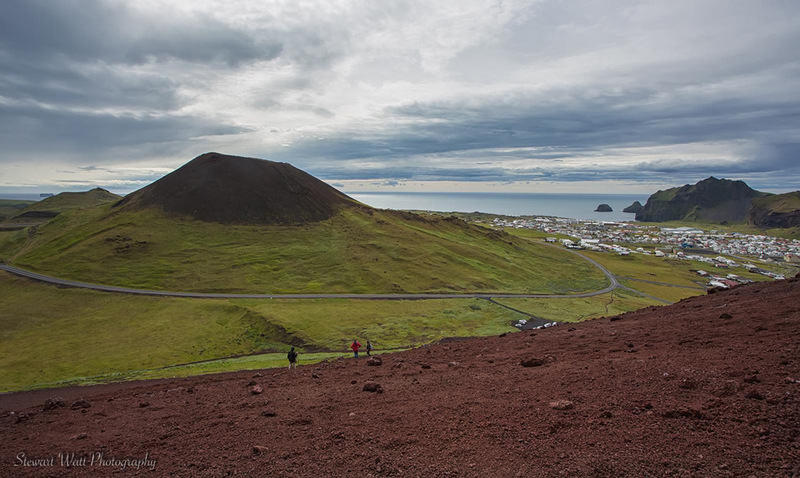 Where it all ended – and in the centre is the top of the dormant Helgafell volcano. This picture, looking in the direction of the harbour entrance, shows the road built after the eruption and for some reason amused me no end. This also shows the lupins which are everywhere. 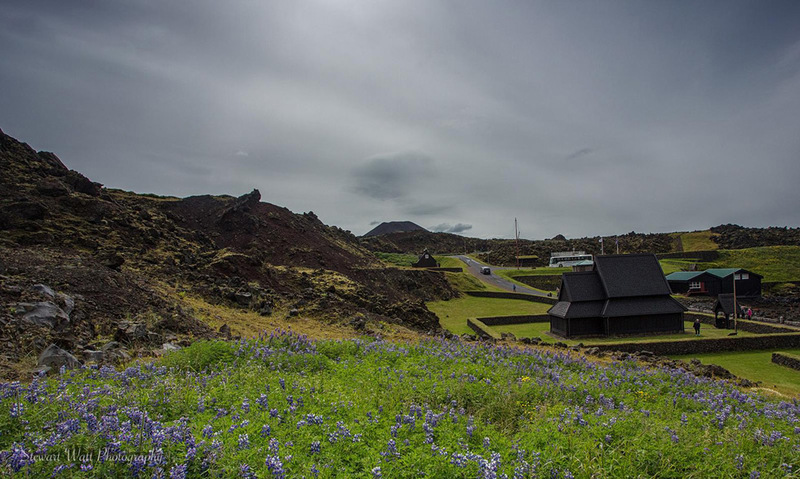 They were planted to stop the soil erosion and pop up all over Iceland thanks to the wind blowing the seeds. Some areas have miles of lupins. 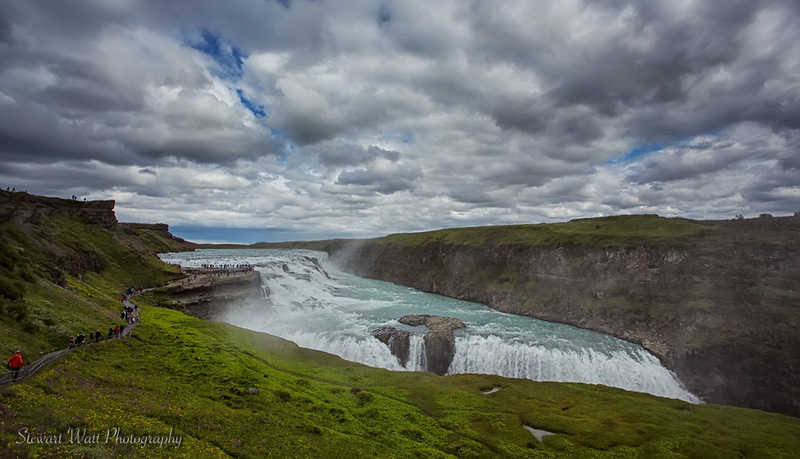 Gullfoss (Golden Falls).A double drop waterfall where from this view the water appears to disappears but actually falls about 30 metres into a narrow ravine. 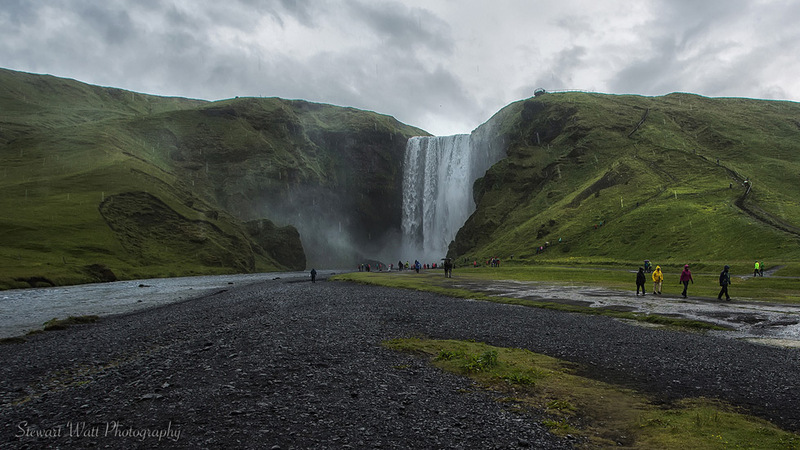 Skogafoss – 25 metres wide and a 60 metre drop. The noise from it is very loud indeed. The view from the viewing platform at the top is quite stunning but is quite a hike up all the steps and, if like me you don’t have a very good head for heights, then it’s quite scary as well. Seljalandsfoss. A 60 metre fall which drops onto what once was the coastline. 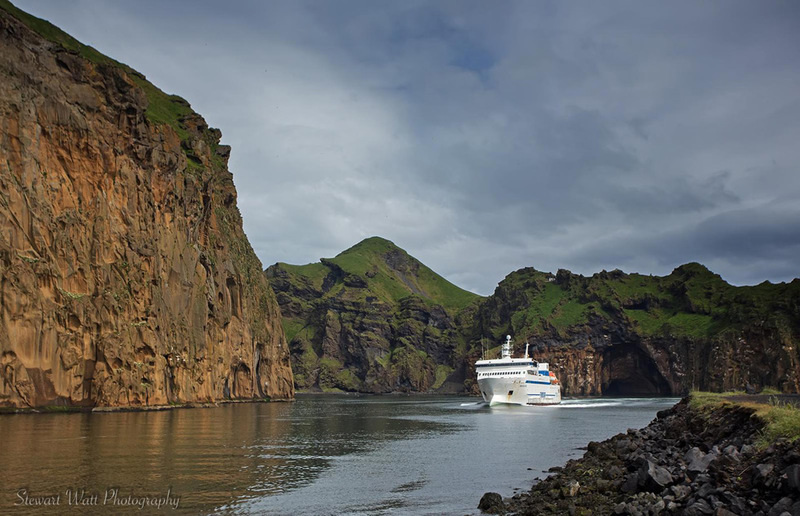 One of its unusual features is that you can walk behind it as the rock face it falls from forms an overhang. It’s a bit wet behind it though as I found out, due to the massive amount of spray. Jökulsárlón. 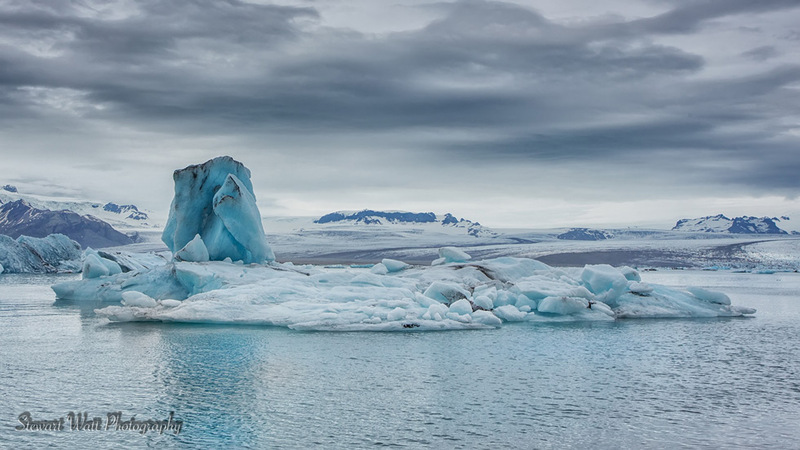 (Glacial River Lagoon).The glacier has retreated some 1.5 kilometres from the ocean edge and has formed the deepest lake in Iceland at 250 metres deep. 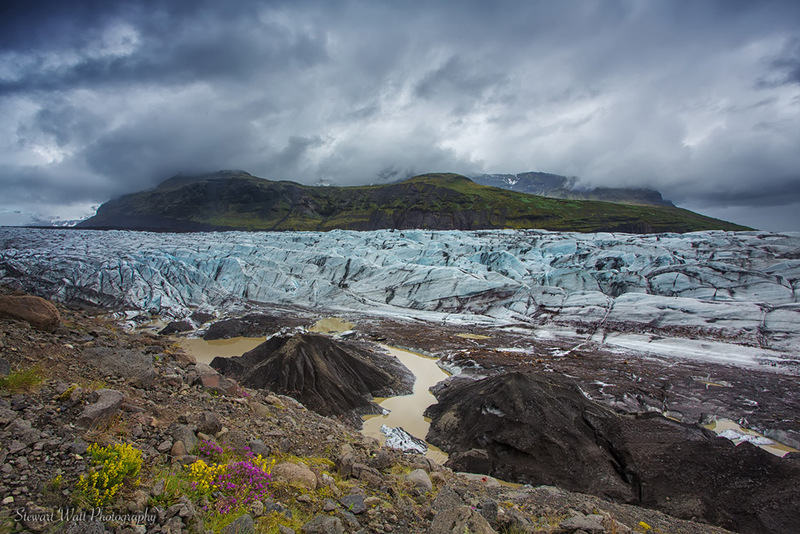 There are 3 glacier tongues that merge here and come from the massive Vatnjokull icecap. 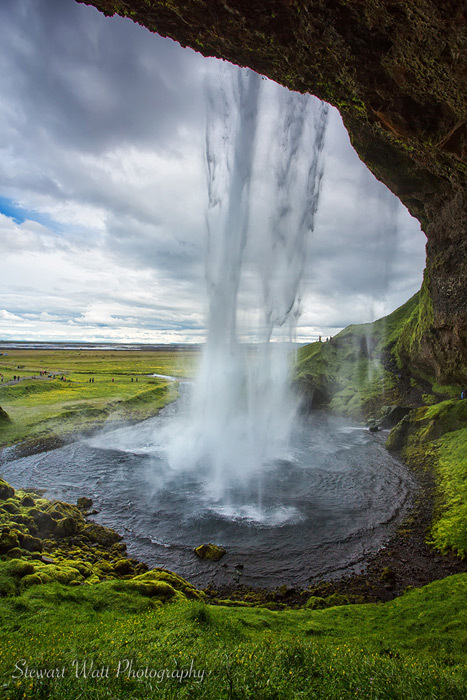 It covers 8% of Iceland’s land mass, 8000 sq kilometres and is the largest glacier in Europe by volume. Its average thickness is 400 metres and at its thickest the ice is 1000 metres thick. It’s the 5th largest glacier in the world. A truly awesome sight and you are only seeing a fraction of it here. A shot of one of the bergs that has calved from the leading edge of the glacier and will eventually make its way out onto the beach through a river outlet. Another glacier tongue from the Vatnajokull icecap a few miles from Jokulsarlon. 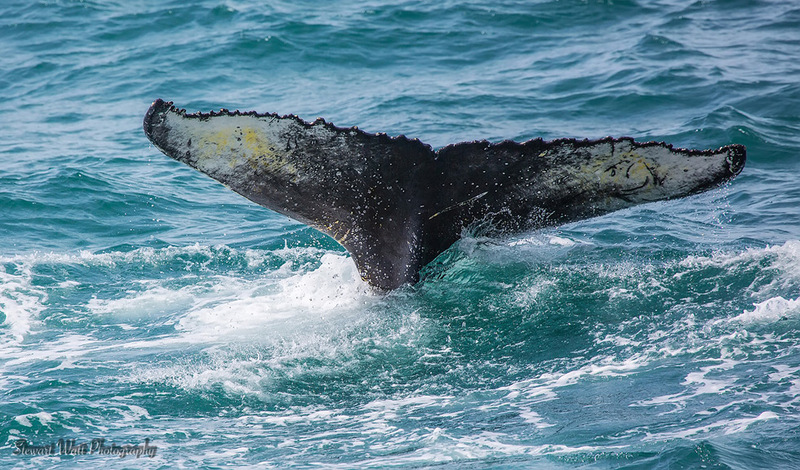 The iconic fluke or tail shot of a diving Humpback Whale. About 1 hour sailing morthwards in Flaxafoi Bay of Reykjavik we were lucky enough to have a very close up encounter of a Humpback. At one stage it was no more than 20 metres from the boat. This was on our first full day in Iceland and to actually capture this shot is a bit of a dream come true. It is truly humbling to be right beside such an amazing creature and something I will never forget. 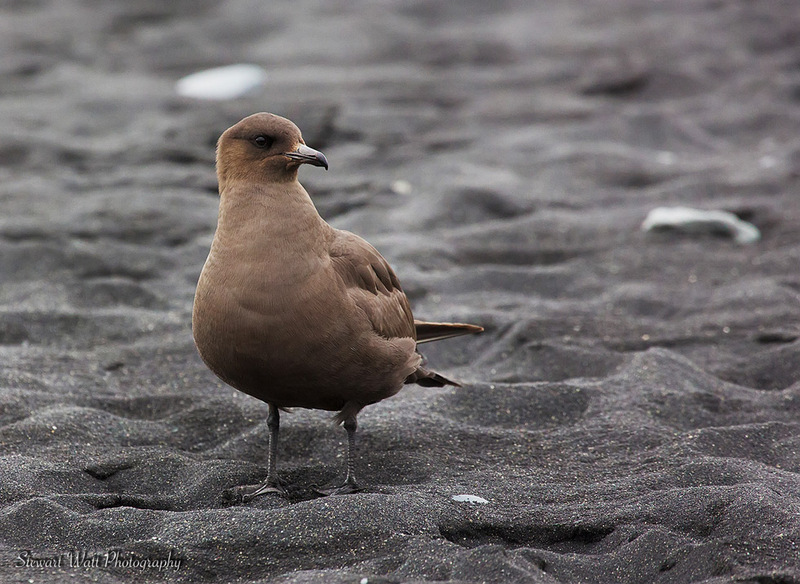 An Arctic Skua. Although we get them in Orkney and Caithness it was again special to see it in its Arctic environment, and of course the black volcanic sandy beach at Jokulsarlon is something we don’t have. 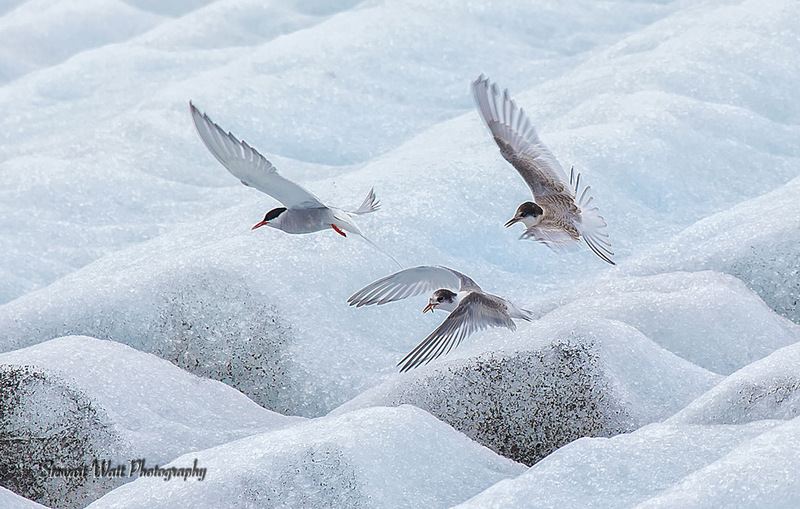 A bird we get in the north and most are familiar with – the Arctic Tern. But capturing it on ice made it special. It looked like they really were at home. The numbers of them in Iceland was hard to believe, they are everywhere and I loved hearing their call as the sun set over Reykjavik seafront. If there is one thing I miss from the holiday it’s hearing Arctic Terns every evening. Continental drift in action at Thingvellir. 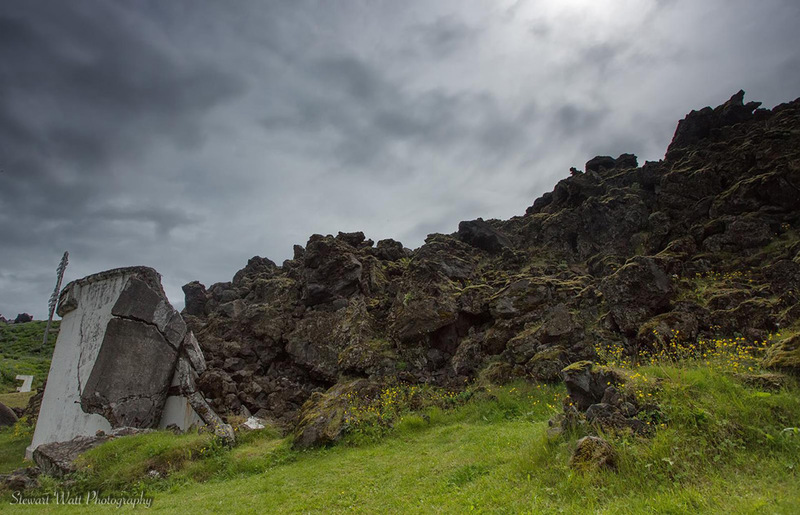 One of only two sites in the world where the effects of two continental plates drifting apart can be seen. The other site is in East Africa. 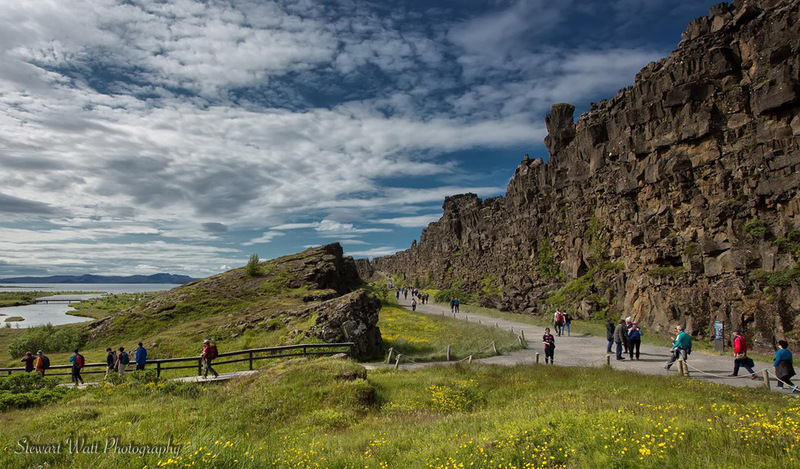 Here at Thingvellir the two areas have pulled apart 70 metres in the last 9000 years and the valley floor has subsided some 40 metres in that time. During earthquakes in 1789 the floor subsided between 1 and 2 metres. This particular split is called Almannagjá and is 7.7 km long. 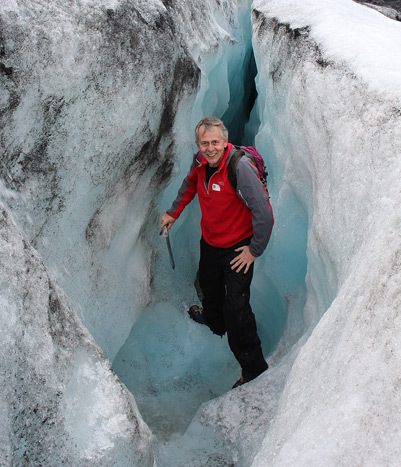 And this is me on a glacier walk on Solheimjokull.Home of the Sun Glacier. Stewart, from Stromness, went to Dounreay in 1975 to serve a Fitter/turner apprenticeship and worked there till 1999 when he moved to a local firm JGC Engineering where he continues today. He programmes and operates CNC milling machines and lathes, manufacturing components mainly for the oil and nuclear industries. His main interests are photography (landscape, wildlife and night sky), bird watching and astronomy.